Bosque del Cabo always has a myriad of interesting projects happening on and around our large land reserve. We are fascinated by the wildlife roaming our 700+ acres of land, not to mention the amazing array of plant and tree species. There are many species of flora and fauna that are endemic to this area, as well. As such, we highly encourage and try to facilitate research projects here. Some of the current projects are listed below. Additionally, in an effort to keep our lodge current, well-maintained and attractive for our guests, we also usually have some kind of construction project going on at Bosque. Aida Bustamonte Ho and Friends of the Osa is currently conducting the largest remote camera project in Central America, right here on the Osa Peninsula! Aida has at least two, sometimes more, camera traps located on our property (mostly on our trail systems) and you may be able to spot some of the camera in places like the Titi Trail. She has two cameras at every site, and the cameras take photos of anything that passes through their beam. The results, so far, have been astounding and very useful in revealing what kind of animal species are roaming this area, day and night. The results from the cameras will offer a large range of data about animal species in this area: types of species, numbers of animals, frequency that animals pass in certain areas, times for hunting and predation, interaction of certain animal patterns and tourism, interaction of different species of animals with each other, and so on. Of course this information can be used for conservation purposes, as well as to gauge the general health of these forests, among other uses. 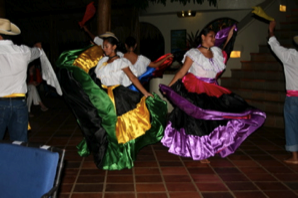 Our talented receptionist, Gerly Medrano, has put together a beautiful Costa Rican traditional dance presentation. She has trained a few of our staff members, who perform typical dance choreographies to our guests on a weekly basis during dinner. This is a colorful, fun event where our staff proudly presents part of Costa Rican folklore and guests are invited to try out their own dancing skills during the presentation! 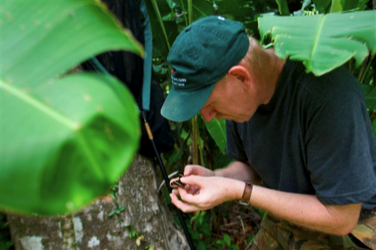 For the past six years Bosque del Cabo has been the centre of a scientific investigation aimed at monitoring the population dynamics of both butterflies and amphibians. The studies are being conducted by Bosque’s on site biologist, Philip Davison. Butterflies and amphibians are very useful ecological indicator taxa for helping assess environmental health. They are both environmentally sensitive and are important umbrella groups, providing an early indication of changes that may affect a great many other forms of life, including us. Both groups are reasonably easy to monitor in terms of numbers as they are visually obvious and with the added benefit of male frogs generally being very vocal. The studies at Bosque del Cabo rely on regular transect counts from which a great deal of information can be extrapolated; species inventories, abundance, seasonality, colonization’s and extinctions. To help provide complementary data for these studies, Bosque del Cabo installed a fully computerized weather station which supplies a continually updated record of climatic variables. With the current concern for global climatic change, it is very important to monitor any potential changes at a local level, over a long period of time in order to evaluate potential changes that may be indicative of a larger and more serious concern. A very exciting new project is in the works at Bosque. We have been asked to collaborate with Friends of the Osa (FOO) in building an Interactive Rainforest Exhibit. The idea of the exhibit is a Bosque guest destination that would both be an educational attraction for all of our guests and a very substantial display to promote and celebrate conservation in this area. Bosque and FOO will be working together to design and build a series of interpretive exhibits near the Palenque in the Tropical Garden, that would feature projects that FOO is conducting, that guests can visit and support, and that will be fun for both adults and kids to check out. These would include, for example, an exhibit on sea turtle conservation, one on scarlet macaws, one on camera trapping the cats and other wildlife, and perhaps one on land purchase or native tree reforestation. These exhibits are currently in the planning and design stage only, but we envision things like, for example, a sea turtle exhibit explaining how to recognize the four different Costa Rican sea turtles, what their nesting biology is like, info on their life cycle and predation, etc. This exhibit will be self-guided and probably will be linked with interpretive tours, for example, in the case of the sea turtle exhibit, a planned sea turtle night walk and hatchling release program. Again, this is all a proposed project, but something we are all very excited about for the future.